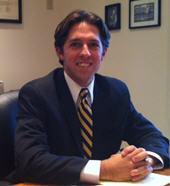 Attorney Michael J. Richards graduated from the University of Rhode Island (B.S. Business Management, 2004) and from Roger Williams University School of Law (J.D. 2009). He is admitted to practice in Rhode Island and Massachusetts and is a member of the Newport County, Rhode Island and Massachusetts Bar Associations. Michael currently practices in the areas of Corporate & Business Law, Civil Litigation, Real Estate Law, and Estate Planning and Administration.